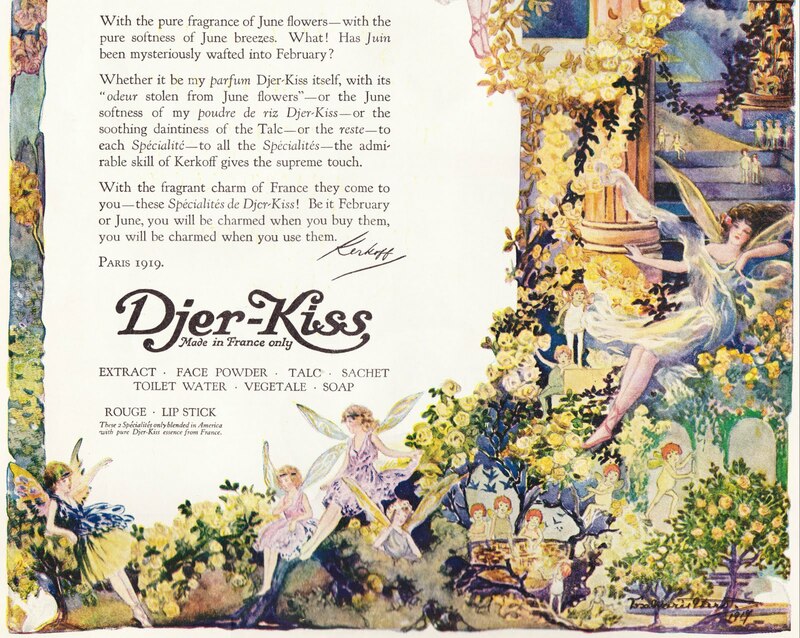 Pictured is a portion1 of an advertisement from the February 1920 issue of The Ladies' Home Journal2 for Djer-Kiss, a line of perfume products made in France. "With the pure fragrance of June flowers -- with the pure softness of June breezes. What! Has Juin been mysteriously wafted in February? "Whether it be my parfum Djer-Kiss itself, with its 'odeur stolen from June flowers' -- or the June softness of my poudre de riz Djer-Kiss -- or the soothing daintiness of the Talc -- or the reste -- to each Spécialitc -- to all the Spécialités -- the admirable skill of Kerkoff gives the supreme touch." If you want to know more about Djer-Kiss and Kerkoff, I highly recommend that check out the in-depth blog Collecting Vintage Compacts. 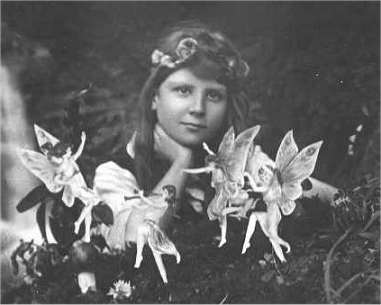 "Emerging in the early years of the 20th century, the French perfumer, Kerkoff, is best known for its fragrance ‘Djer-Kiss’ and also for its extraordinarily colourful and evocative images of fairies in its advertising material. ... Just who Kerkoff was, is not known but this was the name featured prominently on all early Djer Kiss perfume and sachet powder bottles. ... Like many ambitious French perfume houses, the company quickly saw that its future prosperity lay in the wealthy American market and, also, like many it did not establish an office in America but used an American company to manage its affairs. The New York company of Alfred H Smith was appointed as Kerkoff’s sole importer." For much more, read the entirety of "Djer-Kiss - A fairy tale Madison Avenue would be proud of." 1. I say "portion" because this was a large-sized magazine -- 10⅝ inches wide by 16 inches tall -- and the full pages will not fit on my scanner! 2. Ladies' Home Journal was first published in 1883 and is still published today. It is one of the six remaining Seven Sisters magazines. 3. It also occures to me that this is the right time frame and these are precisely the kind of magazine illustrations that Henry Darger was clipping and imitating for "The Story of the Vivian Girls, in What is Known as the Realms of the Unreal, of the Glandeco-Angelinian War Storm Caused by the Child Slave Rebellion." 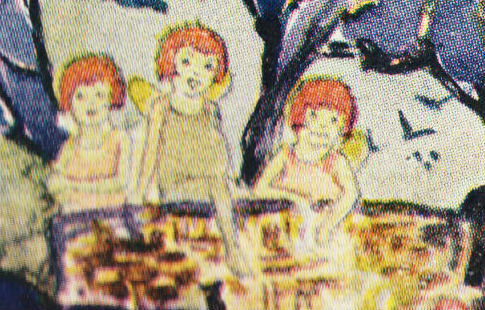 The figures in this small portion of the Djer-Kiss advertisement especially struck me as looking like "Darger girls." 4. Conan Doyle's firm belief in the supernatural eventually led to his bitter rift with friend Harry Houdini. It's a fascinating real-life tale. One book that delves into it is "Final Seance: The Strange Friendship Between Houdini and Conan Doyle" by Massimo Polidoro. Thanks for the great acknowledgement!